Fri 23.12.16 Deck the halls + let’s get this party started! Can you believe another year has passed? 2016 has flown by, even faster than 2015. It certainly feels like we started the new year and, in the blink of an eye, I’ve landed in December. Still, the good thing about this final month of the year is that the office shuts down for a couple of weeks, everyone on the team gets a decent break, and Janine and I get to spend time with family and friends. But, before we turn off the lights on another great year, there’s just one more thing for Jazz Jamaica to do. T’is the season to be jolly…fa la la la…chink…chink…chink…braaapapapp! Never min’ all dat! Put on your dancin’ shoes, go get your frien’ dem, and get down to The Hideaway in Streatham on Friday 23 December for one of our favourite gigs of the year: The Jazz Jamaica Christmas Cracker. Pure, unadulterated ‘phun’! Book early if you want to dine at the club – the tables get booked up ultra FAST – and reserve tickets for you and your party of friends as soon as you can to avoid disappointment. See you there! Really looking forward to tomorrow lunchtime (28 July). 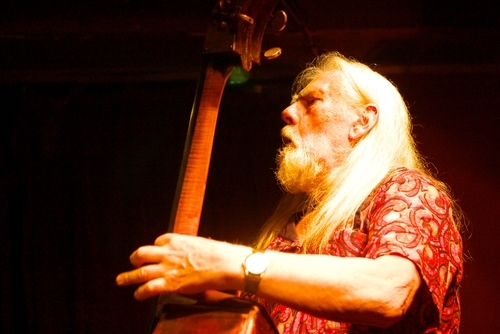 Along with a few others (Pete King, Ian Shaw, Liane Carroll and David Preston) I’ll be playing with my bass teacher, mentor and long-time friend, Peter Ind at Ronnie Scotts in celebration of his 85th Birthday. Going to be a wonderful, chilled out party. Hoping to catch up with lots of old friends. Peter is a truly great individual and a real supporter of the music. Also a great supporter of the young people coming through our Tomorrow’s Warriors programme. Such an honour to be invited to share the stage with him. Good thing I’ve been practising…! PETER IND the internationally renowned double bassist will be playing with Ian Shaw (Vocals/Piano) and David Preston (guitar) in what has become a regular and innovative group since the recording of Ian’s Abbey Road album. For this special lunchtime celebration of Peter’s 85th birthday there will be some special guest spots – Liane Carroll (vocals/piano), Peter King (alto sax) and Gary Crosby (double bass). This is really going to be special – various musicians from the different generations that Peter has worked with will join him for some interesting guest spots – including a unique double bass duo with Gary Crosby. And you don’t even have to pay the congestion charge or be red eyed by the time you leave. If you can, come along to see us. Click here for booking info. Hope to see some of you there. HAPPY BIRTHDAY PETER!